Thank you Donna and Crystal for your kind review. It was great to meet you and have you stay with us. You definitely are a force to be reckoned with Donna and look forward to welcoming you again in the future. This house had everything we needed for our stay. The view was BREATHTAKING! We actually ended up eating most of our dinners in so we could enjoy the sunset view from our terrace. Giovanna made sure we had a wonderful place to visit the Amalfi coast! 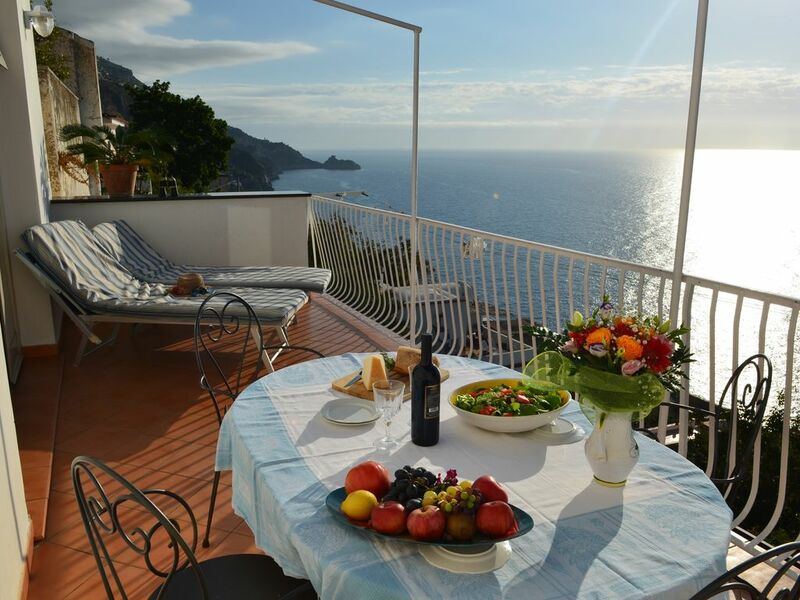 Beautiful two bedroom apartment with fantastic terrace - 180 degree views! Nicely equipped, with great bathrooms. Close to a little market and several restaurants. Be warned there are a lot of steps all over Praiano, but it is a charming quiet village. Pasquale is the on site host with all the info you need, but he is not intrusive. Easy to work with Giovanna. Highly recommended. Thank you for your kind review, so glad you enjoyed your stay. Unfortunately steps are part and parcel of the Coast and not only in Praiano, this is our terrain and what makes the Coast so unique and breath taking. My friend and I had the pleasure of staying 4 nights the first week of September. Pasqual greeting us and helped us with our luggage which was a big deal as the apartment was down over 60 steps. We had seen this in the other reviews so this was totally expected but we were soooo grateful for his help. We had the 2 bedroom apartment, the bedroom/bathroom with the view was unreal, waking up to that was a perfect start to each day. The 2nd bedroom has no windows so just be aware of that if it makes a difference to you. This is located just a bit south of Positano but Pasqual will explain the bus system to you, it is a little confusing without his explanation. We had a car but never moved it once we parked it as we were afraid to not find another parking spot and a little nervous about looking for parking if we took it out exploring. As the other reviews say, you need to be able to do many stairs to come and go from this wonderful spot but the view is worth it. We took a day trip to the Isle of Capri from Praiano Beach which is just a short walk down, but it is a big walk back up, you can take the city bus back as an option which we did. We took the bus to Positano, Amalfi and from there to Ravello which was pretty easy. The bus gets full later in the day so be prepared for that, you may need to wait for several. All in all we loved this place. Thank you for a wonderful and and all your help! !